This illustration summarises the almost 14-billion-year long history of our Universe. It shows the main events that occurred between the initial phase of the cosmos, where its properties were almost uniform and punctuated only by tiny fluctuations, to the rich variety of cosmic structure that we observe today, from stars and planets to galaxies and galaxy clusters. Depicted on the left side of the illustration is the Big Bang, which marks the beginning of the known Universe's history followed by cosmic inflation, an epoch of accelerated expansion that lasted only 10-32 seconds. During inflation, the seeds of cosmic structure were embedded in the Universe as tiny, random fluctuations. By the end of inflation, the size of the Universe had increased by a factor of about 1030, and the rapid expansion had amplified the tiny fluctuations up to cosmologically large scales. In the illustration, the growth of fluctuations during cosmic inflation is represented with black and white bubbles that become increasingly larger as the accelerated expansion proceeds. After the end of inflation, cosmic expansion transitioned to a decelerated regime; then particles formed and the Universe consisted of a more or less uniform bath of fundamental particles, like quarks, electrons and their anti-particles. There were also neutrinos, photons (the particles of light) and dark matter particles, an unknown type of massive particle that does not interact with photons and is therefore dark (as it does not emit light). Particles and anti-matter particles collided and annihilated, and since there was slightly more matter than anti-matter, this left the Universe dominated by matter. Quarks combined to form protons or neutrons – the constituents of atomic nuclei as we know them today. This all happened within the first second after the Big Bang. Within about three minutes (or less than 200 seconds) of the Big Bang, protons and neutrons had combined to form the nuclei of hydrogen and helium. For the first 380,000 years, the Universe was opaque: the density and temperature of particles were extremely high and collisions between particles were very frequent, preventing photons from travelling freely across the Universe. Particles of ordinary matter were tightly coupled to the photons, forming a single 'fluid' of matter and radiation, which is represented in this illustration as a yellow diffuse component. The interplay between gravity, which pulled together the fluid of matter and radiation, and the radiation pressure of photons, which pushed it away, prevented any fluctuations in the density of the fluid from growing. At the same time, however, dark matter particles were not bound to the photons, since the two species do not interact with one another. Fluctuations in the distribution of cold dark matter started to grow denser and more massive before those in the distribution of ordinary matter. This is shown as the purple structure that can be seen building up beneath the yellow diffuse fluid of matter and radiation. About 380,000 years after the Big Bang, the Universe had expanded enough so that its density was much lower than at earlier epochs. The temperature of the Universe had also cooled down from the billions of Kelvin of the first few minutes and had reached about 3000 Kelvin. Protons and electrons could finally combine to form atoms of neutral hydrogen. Electrons disappeared from the view of photons and these two species decoupled from one another. At this epoch, photons were free to propagate across the Universe, which was now largely transparent. We can observe these photons as the Cosmic Microwave Background. The tiny temperature fluctuations in the Cosmic Microwave Background carry an imprint of the slightly mottled distribution of matter at the time when this radiation was released. A section of these fluctuations is shown in the illustration. After the Cosmic Microwave Background was released, ordinary matter particles were free to assemble under the effect of gravity. From this moment on, ordinary and dark matter could both react to gravity: dense concentrations of matter (both ordinary and dark) grew more dense and more massive. Since dark matter particles had already created a network of dense and empty structure, ordinary matter particles (shown in yellow) could feel the gravitational attraction from the densest concentrations of dark matter (shown in purple) and fall toward them. This epoch is known as the Dark Ages – a name arising from the fact that there were no individual sources of light, like stars, only clouds of neutral hydrogen. A few hundred million years after the Big Bang, the distribution of matter in the Universe had produced very dense knots at the intersections of the sheets and filaments that make up the cosmic web. In these knots, the density of ordinary matter was so high that the formation of stars and galaxies became possible. Eventually the first stars and galaxies sparked into existence and light could escape from them, leading to the end of the Dark Ages and revealing the distant Universe to telescopes today. The cosmic web is a highly structured network that kept growing as time went by, giving rise to huge structures such as clusters and superclusters of galaxies, as well as gigantic cosmic voids. Eventually, cosmic expansion would become once again accelerated, driven by a mysterious component known as dark energy. 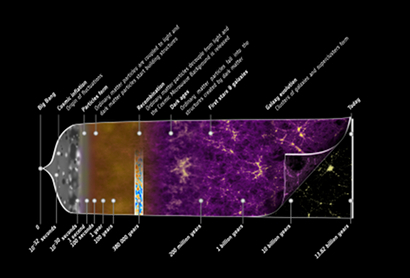 In the lower right corner of the illustration, the distribution of dark matter underlying the cosmic large-scale structure is 'lifted', revealing the more familiar view of the visible structures in the Universe, such as galaxies and galaxy clusters, that we can observe at the present epoch.